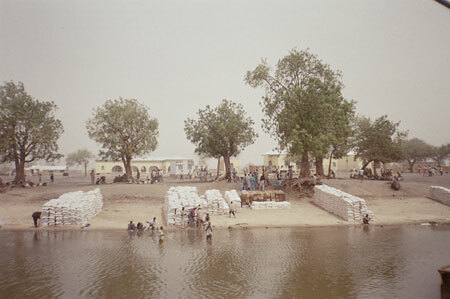 The administrative building in Melut town, with World Food Programme supplies waiting on the shoreline for distribution. Morton, Chris. "WFP supplies at Melut" Southern Sudan Project (in development). 03 Jan. 2006. Pitt Rivers Museum. <http://southernsudan.prm.ox.ac.uk/details/2007.137.60/>.